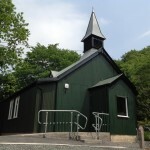 The Iron Room village hall is on the A487 in the village of Eglwysfach 12 miles north of Aberystwyth and 6 miles South of Machynlleth. For "sat nav" users the post code SY20 8SX. There is a lay-by opposite the church for parking 5 cars and additional parking for 5 cars in the Iron Room car park. There is also disabled parking outside the entrance with a ramp for wheelchair users. The Iron Room is Grade 2 listed by CADW and is a rare example of a corrugated iron building from the period of the 1890s. During 2012 it has been entirely restored with an extension to slightly enlarge the hall and provide storage. Inside it is paneled with a stage at one end, a kitchenette and a toilet that has been upgraded for the use of disabled people and also the public. Every effort has been made in the restoration to keep the original Victorian atmosphere yet combined with up to date features. The hall can seat 60 people and is suitable for conferences with projector, screen and microphone; lectures, village and private parties, youth and baby groups, exercise groups and other suggestions for usage will be welcomed. There is also a small garden dominated by an ancient chestnut tree which visitors and villagers can enjoy.